The frameless is the lightest of any comparable hydraulic aluminum and/or steel end dumps. 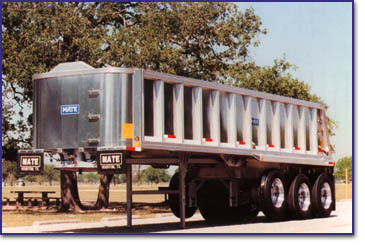 Our frameless end dump trailer suits a variety of hauling needs and has a wide range of uses. The primary advantage of this model over other designs is its weight. The frameless is the lightest of any comparable hydraulic aluminum and/or steel end dumps. Sides 0.150" Hi-temp aluminum alloy 5454-H32. Optional: 0.187". Nose 0.250" Thickness entire height. Hi-temp aluminum alloy 5454-H32 with 3.5 x 5/8" thick banding alloy 6062-T6. (half-frame) 5/8" Flange x 3/8" web aluminum extrusion alloy 6061-T6 to a depth of 18" full length. Draft Arms 3.5" square tube x 3/16" wall with fail-safe strapped end steel bushings. Optional:4" x 7" rectangular tubing with .186" wall with fail-safe strapped end steel bushings. Landing Gear Stiff legs: 3.5" square tube x 3/16" wall upper, 3" square tube x 3/16" wall lower with sand shoe. Optional: Holland Mark V two-speed landing gear. Designed to support loaded trailer. Suspension Air Ride: Hendrickson Intraax; 50,000lb capacity. Our frameless end dump trailer suits a variety of hauling needs and has a wide range of uses. The primary advantage of this model over other designs is its weight.